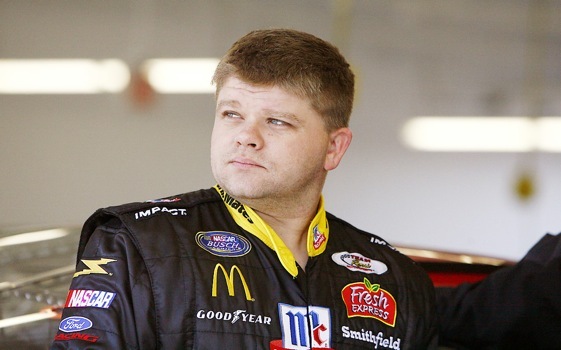 Nashville – After hanging up his helmet for awhile, Bobby Hamilton Jr. is back behind the wheel, and at same time planning to expand his holdings by buying a second race track. “It’s a busy summer,” quipped Hamilton, who made his racing return last week at Pocono in the NASCAR Camping World Series and plans another run Saturday at Nashville Superspeedway. “It’s good to be back, and it’ll be especially fun to race on my home track,” said Hamilton, a fourth-generation Nashville driver. Hamilton has devoted most of his time to operating Highland Rim Speedway which he bought last year, located 20 miles north of Nashville. That opportunity came recently when Hamilton agreed to drive some races for Rick Ware’s North Carolina-based truck team. In addition to Pocono and Nashville, Hamilton will race trucks at New Hampshire and Bristol. He said there is also a possible Nationwide race in the works. Meanwhile he hopes to purchase Riverview Raceway in Carthage, 60 miles east of Nashville. Despite having a reputation for great close-quarter racing, the little paved track is sitting idle this summer. “We’ve been talking to some people and I think it will happen,” Hamilton said about the prospects of a Riverview purchase. Hamilton’s tentative plans call for continuing to race at Highland Rim on Saturday and run Riverside on either Friday or Sunday. As if that’s not enough to keep the 32-year-old Hamilton busy, he hopes to expand his currently dormant Hamilton Racing race team into a truck series operation and also field some Nationwide Series cars. Hamilton last year bought Sadler Racing in Nashville and merged it with his Springfield-based Hamilton Racing. If he fields trucks it will bring back memories of his late father’s championship team. As an owner/driver Hamilton Sr. won the NASCAR truck title in 2004. Hamilton, whose Pocono run ended with mechanical problems and a swipe of the wall, has no illusions about challenging such dominate drivers as points leader Todd Bodine. Spolied brat had a good thing going and managed to screw it up. Think he learned anything from his “throw a tantrum” days? I doubt it.